I am going for my higher studies to USA. Since I am from India, my laptop, electric shaver and mobile charger all run on 220V. What are some good converters, that can run all the above mentioned appliances? No need for converters, your charger accepts anything form 100V to 240V. It is safe to use it anywhere in the world. 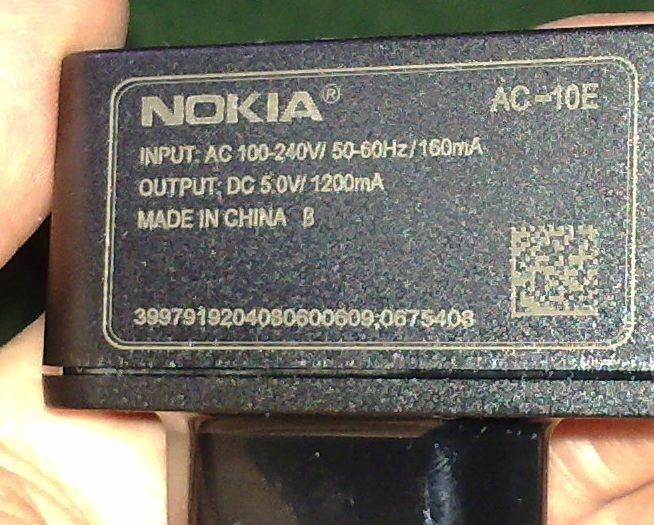 Note that the output of AC-DC adapters will always be the same regardless of the input voltage. Your laptop and phone chargers are designed to operate at a voltage between 100 - 240 V. Your electric shaver on the other hand may not be able to handle the different voltages and will not work in the USA. Unfortunately for the electric shaver, you are stuck with 220V. The best way to make sure is to check on the device or its power supply. An example of how this is written is shown below. This is from a phone charger. You should do this check for any electrical device you wish to carry. Devices with a higher wattage requirement (>500W) typically do not feature cross voltage usage due to a requirement of larger power supplies. Sometimes, smaller devices such as electric toothbrushes, electric shavers, curling irons, hair dryers must be checked as well. An induction cook-top for instance will almost never support cross voltages. If you want to absolutely use your electric shaver in the US, you are looking at spending about $30 for a step up/step down transformer or a special travel adapter for the same purpose (usually has a lower wattage rating). Without this, you can plug it, but your expensive device will not charge at an appropriate rate and you risk spoiling your battery due to overcharging, cutoffs and trickle rates. Also charging on a lower voltage for devices not designed for that voltage means waiting for 3 days for an electric shaver to charge. Believe me I have done this before. Take note that you will require one which allows enough wattage for your device, so I do not recommend going for cheaper options. If you don't wish to take your electric shaver, the other two devices are designed for operation on different voltages and will not have any issues. You will only need an adapter for your plugs, as US sockets are not equipped for either of the two plugs used in India. The adapters for the two pin Euro plugs are easy to find, the three pin a bit more challenging, but probably readily available in India before you leave. If by chance you plan to be in the US for a couple of years of study, many laptop power supplies have a replaceable cable that goes from the power supply to the wall socket, so if it is a major brand you maybe able to find just a replacement cable in the states with the proper plug and not worry about forgetting or loosing your adapter. For your mobile, replacement chargers are a dime a dozen in the box stores and electronic shops in the states. Likewise USB ports that plug into wall sockets are widely available in the states, if your mobile or tablet or other toys use a usb power connector. As others said, most advanced electronic devices (laptop, phone & camera chargers) typically work with a wide range of voltages, 100-240 V (check the label! ), so no voltage converter needed, only a wall plug adapter. Some simpler appliances such as shavers, hairdryers, kitchen mixers, etc. don't usually work automatically with a wide range of voltages. But many of them will have a switch that lets you switch between ~110 or ~220 V. It'll look like a standard slot-type screw head and it will be labelled 110 / 220 V. Check your device. If the device doesn't work with 110 V, then in the vast majority of cases it's not worth bothering with it. Voltage converters are unwieldy, inconvenient, heavy and might not be able to handle enough power to support your device (e.g. a hairdryer---a typical thing that doesn't work with multiple voltages---draws a lot of power). Stuff that doesn't support multiple voltages is almost always cheap enough that it's much better to buy it in the US. Even just considering the cost to carry it with you. Each charger/power supply/device will have an input voltage/frequency rating that you have to check individually. There is no generic " will/will not work" answer as all power supplies can be different. If the input rating is supported you can expect about the same performance as at your home location. Generally there are two broad distinctions between power supplies: A Switching power supply and a "classical" pure transformer based Power Supply. The classical are often simpler and more robust, but are usually bulkier (due to the transformer) and only support a fixed ratio between input and output voltage (based on the transformer windings). Switched power supplies work based on switching the input voltage on and off in high frequencies (and then smoothing the lower voltage output) and thus need only a smaller (and sometimes none at all) transformer, making it often even fit into a little bigger mains plug. Due to this way of constructing it, they support a wide range of input voltages and frequencies, while maintaining the same output voltage and current. In which countries Electronic items purchased from India can be used without any voltage converter and vice versa?